The Man from the Orient! I guess I should formally introduce myself, but I am not very good when it comes to talking about me. Let's hope I don't bore you to tears! My formal violin training came late (sadly), when I was 21 yrs old. As a small child growing up in the 50's and 60's my father would always call me to listen to people like Heifetz and Menuhin when they came on the radio, so my love for the violin started to develop very early on. 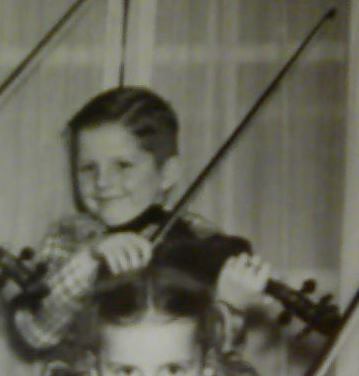 Unfortunately though my parents were unable to pay for a violin or lessons due to extreme hardship, which was commonplace amongst many families during the decades that followed the end of WWII. However the seed had been sown and I continued to listen to as much good violin playing as I could until a time came when enough money was available for me to study with a good teacher. My first teacher, Victor Gambazza was a freelance violinist playing in London. I found his details in the Strad magazine and contacted him making enquiries for lessons. During our phone conversation he asked my age, when I told him 21, he was immediately doubtful about my ability to learn. Then he asked me, (1) can you play any other instruments, and, (2) can you read music. My answer to both was, 'No!' At this point he almost hung-up on me, thinking it to be a joke! But I pleaded with him to reconsider. He made no promises, but instead asked me to come for an interview. He told me that he needed to look into my eyes to see if I was a genuine person. Well I did attend the interview and passed muster and remained with Victor for more than four and a half years. During this time I worked extremely hard, seeing him three times per week. My practice sessions were long and structured, sometimes as long as four hours, but it all paid off. Nevertheless I reached a point where I was generally happy with my playing, but not completely pleased with my sound. I considered this to be a problem with my bowing and as it seemed that Victor was unable to help me further I sought a new teacher. This teacher was Michael Zabludow who was the former assistant leader of the London Philharmonic Orchestra. Mr.Zabludow was of the Carl Flesch (Max Rostal) School and had a very different temperament to my first teacher, he was extremely strict! After a brief phone conversation he agreed to an audition, instructing me that I should prepare some music. I played safe and stuck with what I knew best, at that time, some Vivaldi sonatas. On the day of the audition I was so nervous I couldn't stop shaking, but I managed to play my pieces, all be it very badly and was ready for a rejection! Strangely this did not occur. He looked at me whilst scratching his head and said, 'well that wasn't very good was it, but I can hear some good things and I think I can help you!' I was ecstatic, but maintained control until I returned home! Lessons with him were a mixture of playing, watching and listening, in particular listening to old 78rpm recordings of David Oistrakh who he adored. I was not completely sure that his form of teaching would work, but it did. Soon I noticed an improvement in my sound so I decided to test this out on my family. After listening to a few pieces they all agreed that my bowing looked more graceful and controlled, and my sound much, much better. Sadly my time with him was brief, but he liberated my sound through improving my bow action and control. I will always be very grateful to him for teaching me the art of bowing. After this I spent two years at Colchester Institute Music School where my professor of violin studies was Beth Spendlove, a graduate of the London Royal Academy of Music and The Yehudi Menuhin School. Beth was a wonderful teacher, always encouraging and very supportive when things went badly. Amongst other things, I studied the Bach A minor concerto, Meditation by Massenet, Berceuse by Faure, and many other wonderful pieces whilst under her tutelage. Just in case you are wondering why a London boy ended up in the Far East, well it’s a long and rather sad story that I won’t go into now. But it is sufficient to tell you that a few years after graduating from Colchester Institute my life was to change irrevocably and I found myself on the way to the Orient! If you want to know more you will have to befriend me and ask. Hi Paul, I'm glad you are here and hope that you are able to stick around. We have some very good people here and you will fit in easily. I'm sure you will be a great asset here at Fiddlerman. It's good to see / have an accomplished violinist among us. Thank you for the background . Ken. AKA in Chatango as Fiddleandbow. Glad to have you here, CF. What Ken and MrYikes said. Really enjoy knowing more about you, and I'm so glad that you're here. There are lot of nice people. Thank you for the nice comments, I just hope I can be of service or at least a little useful. To be honest I don't actually play much these day due to nerve damage in my right shoulder from a motorcycle accident in my youth. However I always try to play some scales and studies everyday even though I suffer discomfort. Nevertheless I still consider myself a good teacher. isnt it funny how sometimes you end up on the other side of the world? i was in south korea for a couples of years....good times. great story! and welcome! i can imagine you'll get alot of questions. Well its good to meet you paul!! Its always nice to have new voices in the forum and it sounds like you have a great background! Glad you're here!!! !